The Halal Gourmet Dining for Chefs workshop is a part of the CrescentRating Chef Accreditation Program which will launch in Cape Town, South Africa. The 2-day workshop on 4th & 5th October 2017 is designed for professionals who are associated with the hospitality-culinary industry, those who wish to join the Halal industry and even those who would like to improve their existing Halal production and other deliverables. The workshop covers different topics from the concept of Halal food to catering to Halal travelers and guests and understanding the application of Halal in kitchen use. Participants will gain valuable knowledge about the Halal food industry and learn new recipes complete with practical application from this culinary program. Another prime focus of the program is on the positive aspects of including quality Halal ingredients in food preparation and production. Chefs who apply for the program will gain better insight into the Halal industry and food preparation as well as how to create Halal menu for Muslim guests. The Halal Gourmet Dining for Chefs workshop is suitable for entry-level, commis or pastry chefs as well as experienced professionals who have successfully completed relevant Food and Hygiene courses. Experienced Muslim or non-Muslim chefs who wish to enter the Halal industry or further enhance their knowledge may apply for the program. Successful chefs will be awarded the CrescentRating Accredited Chef badge upon meeting the assessment criteria. Two chefs will be selected at the end of the 2-day workshop and win a 5 days 4 nights trip to Singapore! - What is Halal Meat? Based on the assessment results of Day 1, 20 qualifying chefs will take part in a hands on practical demonstration with Chef Javed Ahamad where they will learn how to cook a Halal 3-course fine-dining meal with a twist. Winners will be announced on 6th October so stay tuned and follow our Facebook and Twitter for the latest updates! The Halal Gourmet Dining for Chefs workshop will be conducted by culinary experts - Chef Muhammad Kamal Bin Khamis and Chef Javed Ahamed who will share their extensive knowledge in Halal food preparation and cooking. Chef Muhammad Kamal Bin Khamis is the President of the Singapore Halal Culinary Federation and Co-founder of KitchenSq LLP with years of expertise in the culinary industry complete with certifications in assessing, educating and training. Chef Muhammed Kamal also was also part of ‘Singapore Culinary Journey’ in 2011 as well as Halal Expo Japan and the Singapore Food Festival 2013 in United Arab Emirates. Chef Javed Ahmed has more eleven years of experience in Singapore starting from Rang Mahal in Pan Pacific to Song of India and is now currently the Corporate Chef at Punjabi Grill. 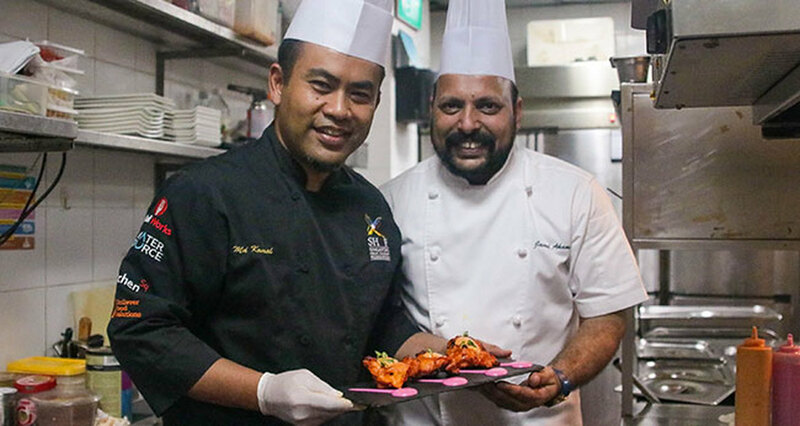 Chef Javed has mastered his skills with years of training and is a culinary expert in Indian cuisine, who has introduced Singapore to unique culinary experiences. All participating chefs will be awarded with certifications endorsed by CrescentRating and the chefs from Kitchen Sq who will be conducting the workshops. Additionally, those who are willing to participate in the assessment after the workshops will receive the CrescentRating Accreditation certification if they successfully qualify. This program is designed to make an impact on the Halal food and hospitality industry through training and educating participants who are part of the culinary world.